A favorite Greek street food and snack, bougatsa is traditionally made with very large handmade phyllo sheets that are folded over multiple times before being folded over the filling. This version of bougatsa calls for commercial phyllo dough. 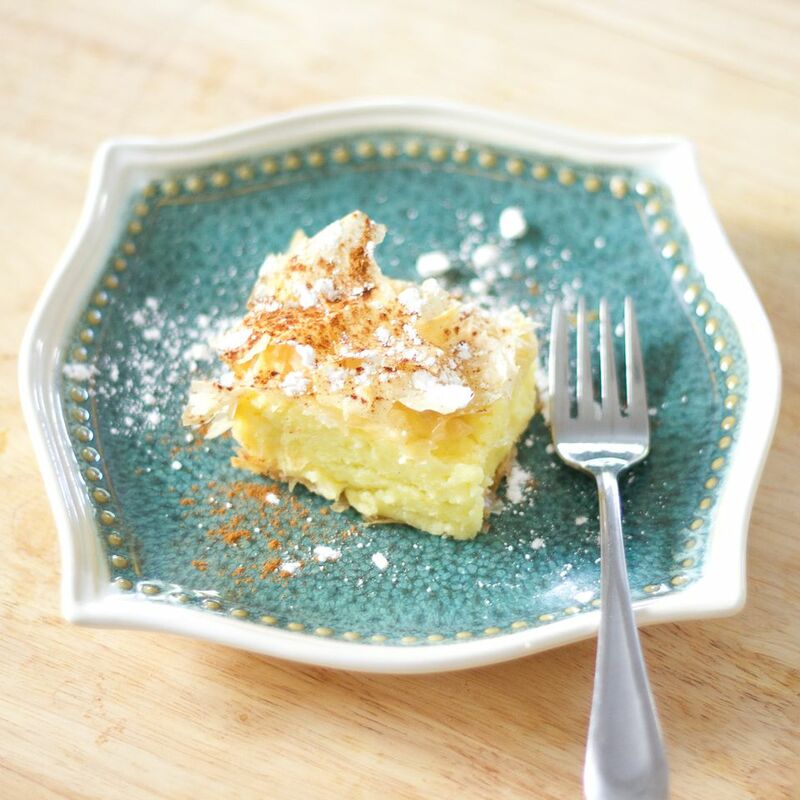 It has a creamy custard filling and is sliced and served warm, sprinkled with confectioner's sugar and cinnamon. Warm the milk and lemon peel in a saucepan. Stir in semolina with a wooden spoon until the mixture is thoroughly blended and thickened. In a mixing bowl, beat the eggs, sugar, and vanilla until light and add to the pan, stirring over medium-low heat until it reaches a creamy custard consistency. Remove from heat, take out and discard lemon peel, and allow to cool completely. Stir occasionally to keep the custard from forming a skin on top. Lightly brush a baking pan (13 X 9 X 2 or equivalent) with butter. Line the bottom of the pan with 8 sheets of phyllo, brushing each sheet well with the melted butter. Add the custard filling. Fold the excess phyllo that overlaps the pan in over the custard. Top with the remaining phyllo, brushing each with butter. Use scissors to trim the top sheets to the size of the pan. Spray the top lightly with water and bake at 350F (180C) for 30-40 minutes, until the top is golden brown. Remove from oven, sprinkle with confectioner's sugar and cinnamon while hot, and serve warm. Serving tip: In Greece,bougatsa is cut with a pizza cutter.